After you’ve brushed and flossed your teeth every day for so long, it’s natural to grow a little less diligent about doing so correctly. 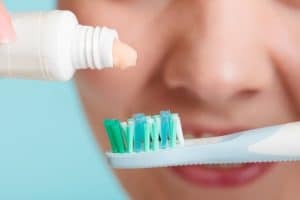 You may rush it some mornings or not fully pay attention on others, making it more likely that you’ll miss spots of plaque. When you do, those spots calcify, turning into tartar and becoming impervious to your toothpaste and water. The formation of tartar is the reason why chronic issues like periodontal disease form – the bacteria within the biofilm have ample time to attack your teeth and periodontal tissues. Today, we offer a brief refresher on good hygiene so you’ll be less likely to let such risks slip by as you clean your teeth every day. If you can feel dental plaque on your teeth, then you’re more likely to want to brush and floss it off as soon as possible. However, you may not always feel the biofilm when you run your tongue across your teeth and that can fool some patients into believing their teeth don’t need cleaning. Even if plaque isn’t obvious, be sure to brush your teeth at least twice a day and floss at least once, every day. Plaque doesn’t just cling to your teeth; it also develops on your gums, tongue, and other oral tissues. When you brush and floss, be sure to carefully brush along your gum line and clean your tongue with your toothbrush or a tongue scraper. Also, pass your toothbrush along the roof of your mouth (palate) and cheeks to clean away any residual plaque. In addition to brushing and flossing, be sure to a dental checkup and cleaning at least once every six months. Even with due diligence, you can miss minor spots of plaque that could become seriously threatening to your smile later. Your regular dental visits will ensure that any lingering plaque and tartar don’t remain long enough to become a threat. A good and consistent hygiene routine is the key to keeping your smile healthier and free of periodontal disease for longer. For more information, schedule a consultation with Dr. Kania by calling her periodontal office in Encinitas/San Diego, CA, at (760) 642-0711.